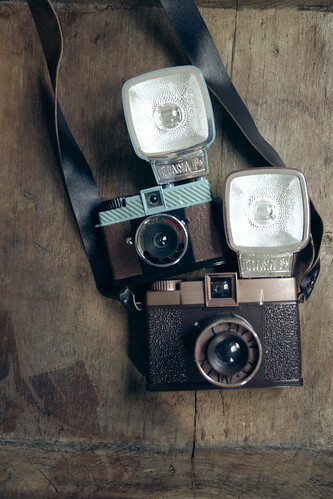 The Diana Mini is a plastic camera from Lomography styled to resemble the Diana, but shrunken in size. As a camera designed for 35mm film, it provides an automatic frame counter (rather than the red window of the original); and it discreetly hides a rewind crank on the bottom of the camera. The Mini has a selector to switch from 24×24mm square format to 17×24mm (half-frame) images. The Mini has sockets on the top of the camera which can accept the same flash used with the Diana F+ or via an adaptor any hotshoe flash (this is provided with the flash pack versions). The camera has been designed so that there is no lock to prevent multiple exposures. Lomography specifications indicate the camera has a 1/60sec shutter setting on N. Others have suggested it is nearer 1/100sec. This page was last edited on 1 January 2014, at 00:14.